on Twitter in the West Midlands! Ok, so OMG am I chuffed right now. I was just going about my usual evening business when up pops a tweet on Twitter, tagging me in it - I had to glance twice to see what it actually was but then I saw it. 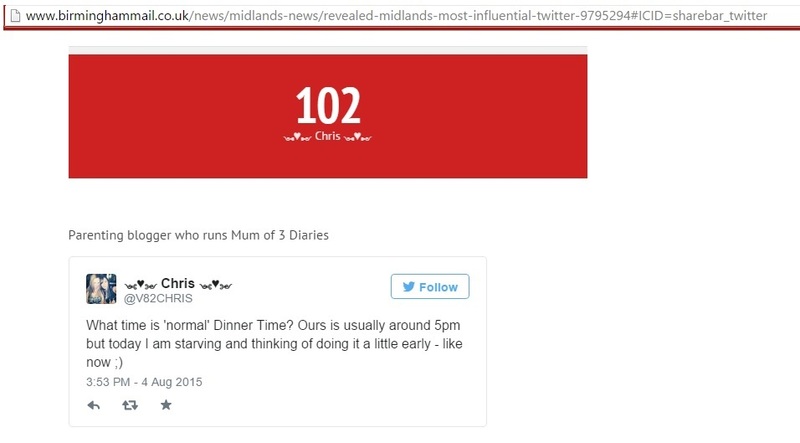 A list of the Most Influential people on Twitter in the whole of the West Midlands number 150 to 100 and in there somewhere was little old me. 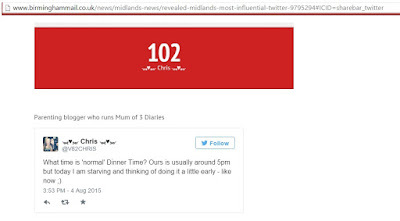 I had seen the list on Facebook a few days ago when it was started on the Birmingham Mail's Facebook page but when I wasn't in the first list published of numbers 250 to 200 I had accepted the fact quite humbly that I hadn't made it so to see my name and Twitter handle right there at spot 102. I am OVER THE MOON to say the least! I am feeling so proud of myself right now. It's not often that I 'blow my own trumpet' but tonight I'm going to make an exception so please excuse me. I love Blogging and enjoy everything about it. The opportunities it gives my family, the people I've met and the friends I've made. It's been an amazing journey and one hell of a rollercoaster at times but one that I never want to get off. My little blog started as a simple diary of our everyday lives but has now grown into so much more. It's my voice, my journey and sometimes my escape. Sitting there just 2 places above Drayton Manor Theme Park which is one of our favourite places ever, I am completely amazed. To think that I am 'almost' as influential as them - Wow that's just crazy! Right now, for just one night. I'm kinda thinking that MY blog is a little better than I had thought it was after all and I am one very proud Mummy. Everyone who knows me, knows that I am a major Twitter addict. It's no secret. If you don't follow me (which is okay) as my Twitter gets a little crazy at times just like me so if you like a nice calm, empty screen then I'm not one to follow anyway but if you like lots of general chat, competitions and blogging stuff in general then give me a follow - I'm @V82CHRIS and more than happy to welcome you aboard my crazy Twitter Train. I was just on my way to bed before all this happened but there's no way I can go now, I'm just so hyper. I don't think I could get to sleep now even if I tried. Eeek, I hope this happiness wears off soon, as I'd really like to get my head down, I'm knackered. Okay, I'm going to stop banging on and get back what I was doing. That might involve me running around the living room like a lunatic but It's just for tonight, I promise. As of tomorrow morning, I will be back to my normal, composed, non horn blowing happy self. For anyone who'd like to see the list. Numbers 150 to 100 can be found Here. I'm rather excited to see who made the top 100 - I'm sure I'm bound to recognise a few names. Until next time, Sweet Dreams and Good Night.